1. Introduce the concept and vocabulary by asking open-ended questions: * Have you ever seen a rainbow? What colors did you see in the rainbow? * When do rainbows appear? * What foods do you like that are red? orange? green? purple? Hold the book, calling children’s attention to the title. Read: "Can You Eat a Rainbow?" Ask children to predict what the boy on the cover is thinking. Show the back cover and read the copy. Ask children whether or not they think a person can really eat a rainbow. Why or why not? Ask them to notice some of the fruits and vegetables surrounding the children. The book contains familiar words: eat, rainbow. The text is on the page facing the photograph. Only one word changes on each page. The exception is page 14, where two words are added at the end of the sentence pattern. There is no sentence on the last page, but the photo presents the overall concept of the book. 1. Set a purpose by telling children to read the book and find out whether or not a person can eat a rainbow. Do their eyes go over to the photos before reading the new word in the pattern? /r/ - /e/ - /d/ or blending the sounds? As children read, suggest a reading strategy if they are struggling: "Try looking at the photograph to make sense of the print." Encourage children to take a guess or use the beginning letter sound. Review using initial consonants, blends, and digraphs; and long-vowel sounds to read new words. Provide help with reading two-syllable words. Talk about the photograph on page 16 and how it is different from the rest of the photos. Call attention to the question mark in the title. 1. Have children confirm their predictions and talk about whether or not a person can eat a rainbow. Model how the title should be read differently because of the question mark. Ask children what kind of rainbow the story is really about. Help them see the connection between the colors of the foods in each photo and the colors of the rainbow on the front cover. Have children look at each photograph in the book and name as many of the foods as they can. Have them vote on which food is their favorite for each color. Ask children to look at the child in each photo and suggest what the child might say about the food he or she is holding. Focus children’s attention on the last page and talk about the rainbow of fruits and vegetables shown. Have children suggest some text that might accompany the photo. Discuss why it is a good idea to try and eat a rainbow. Compare the rainbow on the last page to the rainbow on the front cover of the book. How are the rainbows the same? How are they different? Make several sentence strips of the sentence pattern in the story: “You can eat ___.” Also make a set of cards for the color words and another set of cards with pictures of fruits and vegetables. As a class activity, complete the sentence strips using the word cards to make a series of sentences. Then have children match each picture card to the sentence with the correct color word. Children may also write their own sentences using their favorite colors. Research rainbows with children. Help them find the answers to the following questions: What colors are in rainbows? Do all rainbows have the same colors? Are the colors always in the same order? What order are they in? Challenge children to count the number of different fruits and vegetables shown in each photograph in the book. They should count just the types of food, not individual items. Divide the class into six groups and assign each group to count red, orange, yellow, green, purple, or white foods. After each group has its total, record the results on a bar graph. Plan a trip to a local fruit market, farmers market, or grocery store and arrange in advance for someone to talk to children about the fruits and vegetables that are for sale. At the market or store, have children see how many fruits and vegetables from the book they can find. Then have the speaker tell children about some of the foods that may be unfamiliar to them. If it is possible to sample some of the foods, that would be an added bonus. Make a list with children of descriptive words for the different fruits and vegetables in the book. (Even if children have not tasted some of the fruits and vegetables, they can describe the physical aspects of the foods.) As a whole class-directed writing lesson, develop a simple, free verse poem about each color food utilizing descriptive words from the list. Write each finished poem on chart paper. Divide children into groups and have them add illustrations to the poems. Hold a health fair and invite other classes to sample fresh fruits and vegetables of different colors that the class arranges in a rainbow display. Have children explain to the visitors why it is important to eat a rainbow. 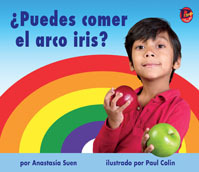 # ¿Puedes comer el arco iris? The Spanish edition also uses a patterned sentence and familiar words: comer, rojo, anaranjado, amarillo, verde, morado, blanco, arco iris. Because many children speak dialects or may mix Spanish and English, you may need to help children understand that “book language” does not always match the words we use every day.